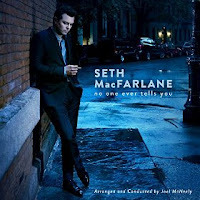 Seth MacFarlane IS the next Frank Sinatra. I’m listening to his new album, No One Ever Tells You and let me tell YOU, old blue eyes is in for some competition. Yeah. I just said that. And yes, the guy behind ‘Family Guy’ and ‘Ted’. I KNOW, I know. His humor may be lewd and crude but it’s smart too. Uh, what was I saying? Oh! Why I really like this guy. He’s smart. But mostly that he refuses to stay in his little box. I LOVE that this guy created Family Guy and Ted and a bunch of other stuff but that he started as an animator, doodling on scrap pieces of paper and now he just flipped out a totally surprising and amazing album. Labels are for LOSERS I tell you. I’m a stay at home mom. LABEL. Icky, sticky, limiting label. I’m a WRITER. (Label) And a comedian. Comedianne? Canadian, for sure. I’m a POET. And a baker. An amateur surfer and scuba-diver. Yogi. They don’t say anything about me. They’re all me and none of them are me. How I love to read and mountain bike. How I love Taylor Swift and Jai-Jagdeesh. Just because I’m one thing doesn’t mean I can’t be other, seemingly conflicting, things too. Life is ACTIVE. It isn’t passive. It isn’t stagnant. It’s change. It’s growth. We may all have a purpose here on earth, something specific we’re meant for but for sure we’re all meant to GROW. To learn. To adapt. To learn new things. To try new outlets for our creativity. To stretch our fingers and our wings and just JUMP. I’ve met people who can’t do this anymore. They’re stuck and miserable. They want to try ball room dancing but they’re afraid someone will make fun of them. Or they can’t give that to themselves unless there’s a practical outcome. Unless it makes money or serves to make them skinnier or more attractive. They have this hidden yearning for something more but they can’t allow themselves to take it. They can’t just let themselves have that experience just for the sake of enjoying it. Taking a cooking class or trying Krav Maga. Attending church service with your mom. If it feeds your soul I think it’s your responsibility to follow those bread crumbs where they lead. Even if it’s not to fatten the wallet or thin the tummy if it gives you even a moment of joy and peace it behooves us to allow more of that into our lives. The world is a beautiful place that needs fulfilled people in it, seeking to serve. So go hug a teddy bear. And buy that book on how to pickle asparagus already. The world needs you. And Seth, dear sweetly singing Seth…I’m a married woman and so completely off the table I’m sorry. But we’ll always have Paris. Oh and if you're shopping on Amazon anyway, if you shop at the AmazonSmile link below they'll donate $3.00 to the Leukemia and Lymphoma Society with the first purchase.